Home Actualité MAISON JEAN ROUSSEAU CELEBRATES EASTER WITH CHOCOLATE-SCENTED LEATHER! MAISON JEAN ROUSSEAU CELEBRATES EASTER WITH CHOCOLATE-SCENTED LEATHER! 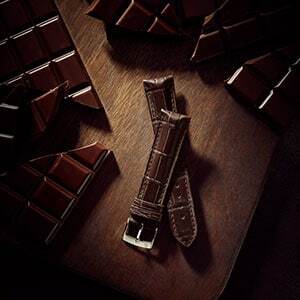 To celebrate Easter, Maison Jean Rousseau is delighted to introduce its latest innovation: chocolate-scented leather. Made to complement every watch strap and small leather good of the brand, the chocolate perfume is released after a slight friction of the finger on the leather. An excellent gift to awake gourmets’ sense of smell… and taste buds! From April in Jean Rousseau’s boutiques, clients will be invited to discover leather goods which very special finish releases a pleasant chocolate smell! Achieved through perfume microcapsules spread on leather with a pistol at the Manufacture, the cacao smell is released once the leather is gently rubbed with the finger. Just like every other Jean Rousseau product, this scented leather meets the highest manufacturing standards and is harmless for the consumer. With this innovating finish adaptable to every Jean Rousseau leather creation, the brand has successfully managed to work on a sense barely activated in the watchmaking and leatherwork world: the sense of smell. While chocolate evokes travels and adventures, its gourmet dimension also matches Jean Rousseau’s ambitions to always offer personal and hearty creations. Created in 1954, Maison Jean Rousseau has always perfected its creativity, associating its strong sense of modernity to a solid cultural and artisanal legacy. With this scented leather that renews the experience of precious skins, it once again shows how innovative the brand is. As Easter is just around the corner, the chocolate scent is the one that is being celebrated today. However, many more olfactory surprises are to come. Rendez-vous in all the Jean Rousseau boutiques.